I don’t know what it is with me and chicken-themed games lately. That doesn’t seem like a pattern that would exist in gaming, but lately I’ve played a couple fantastic and totally different video games that had a chicken protagonist. First was Chicken Wiggle, where you play a duo of chicken and worm and use their unique skills to navigate levels. Then I saw Bomb Chicken in a Nintendo Direct. I didn’t know anything about it, other than it looked quirky and had a lot of charm. Fast forward a month after it released, and I decided to take the advice of some friends and purchase myself a copy. The question is, which came first – the chicken or the bomb? 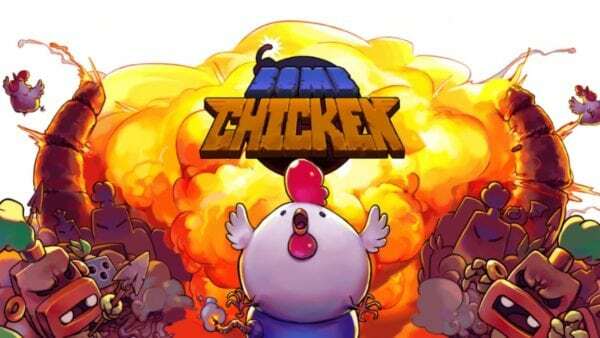 One thing I instantly appreciated about Bomb Chicken was the pure simplicity of the game. That doesn’t mean it’s an easy game or a poorly designed one. Rather, it’s like a haiku, short, sweet and elegantly crafted. The entire game is composed of 29 stages, including three boss fights, but nothing feels extraneous or out of place. Likewise, the game doesn’t hold your hand, but rather gives you little pointers how to proceed. Often you’ll find visual clues that tell you how to progress, and once you get the basic mechanics down, it’s very fun to experiment on the fly. The controls are easy to learn, but trickier to master. All you can do is move around or lay bombs with any face button. You can’t jump exactly, but by laying a tower of bombs, (You can lay about nine before they explode) you are then able to fall onto things and squash them. By walking into bombs, you’ll push them forward with a headbutt, which lets you hit distant targets. These mechanics comprise the core of the gameplay, but there’s a lot of nuance to it. 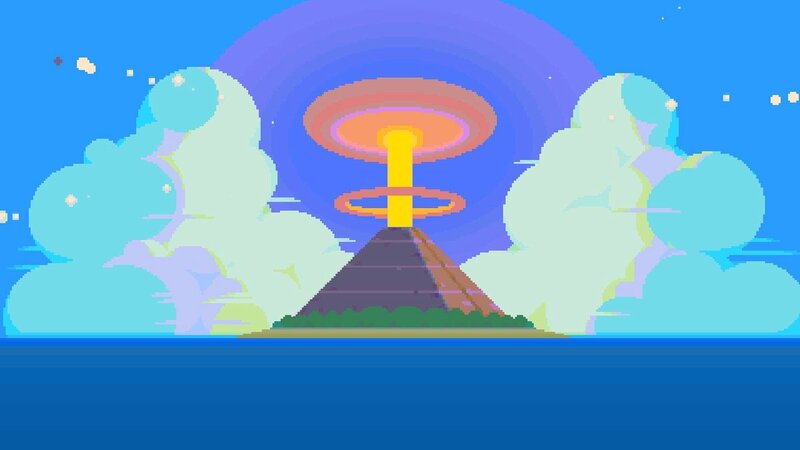 For example, you can lay as many bombs at a time as you want, but the moment you plop one out, the timer starts ticking. Any bombs in close proximity to another will explode together, and if you’re touching a bomb directly, you’ll perish. However, by standing a little bit away from a bomb, you’ll be perfectly safe. You can also use bombs for more than offense. Each bomb is roughly the same size as your clucky hero, so by laying one and getting alongside it, it will temporarily shield you from projectiles such as arrow traps. It won’t, however, save you from fiery projectiles, which will prematurely set off your bombs. Much like the controls, the levels start simple and add more and more twists the farther you go. You’ll have mechanics like switches you need to hit, key cards you need to open gated doors, platforms that burn up when a bomb explodes, blue goo that makes dangerous ripples from your explosions and others. Besides that, there will be many threats to your feathered existence, such as buzz saws, roving turrets, arrow traps and a whole host of colorful enemies. Early on, foes will be pretty oblivious and just let you run up to them and blow them up with a bomb, but then the game introduces enemies that charge you with spears, mandragoras that constantly sprout from the ground, flowery fiends which spit streams of seeds, ghostly foes that can’t be killed but only temporarily disarmed, and much, much more. I was frankly quite impressed by the variety. 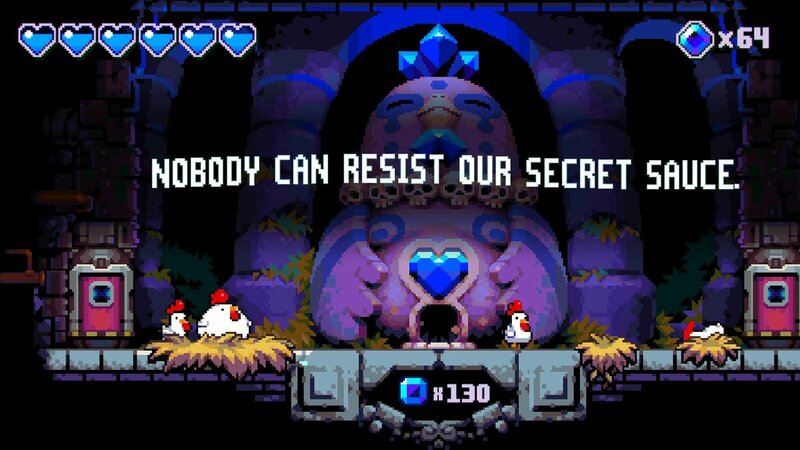 Perhaps most impressive were the boss fights in Bomb Chicken. While there are only three of them, each one is completely distinct and offers a robust challenge. I won’t spoil how to win against them, but just remember to pay attention to their attack patterns and look for visual cues which indicate weak spots. While it’s true there’s not much plot in the game, there’s just enough to keep you invested. The premise is something like this. Imagine if a KFC was built on a Mayan death temple. Heavy machinery and magic mix together, and you get an lone egg transformed by some really special sauce into your plucky hero. Your only goal is to escape with your life, and the farther you go, the weirder things get. 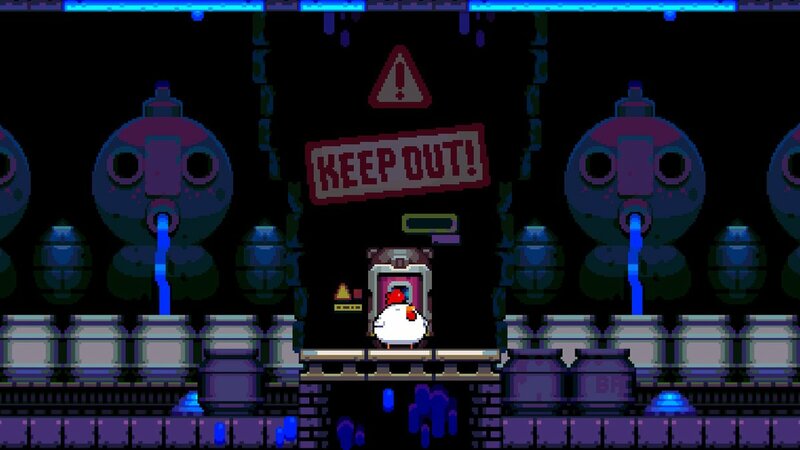 In between each level, you’ll come across a giant chicken statue that lets you trade in gems for extra lives. This is really important to do, since the levels get more and more challenging and one hit will kill you. As you progress, levels will require quick reflexes and quicker strategies. It’s in your best interest to look everywhere for gems, especially since some are quite well hidden in massive chests, usually in a rather challenging trap room. While you’re not forced to get them all, doing so gives you a maximum of nine lives to try each level, which you’ll be glad you have later in the game. Visually, the game is a delectable mix of beautiful colors and delightfully detailed sprites. Everything in the game expresses a lot of personality and humor, which is rare these days. Some examples are the way your chicken waggles his tiny wings when falling, or how he resurrects himself as a bomb that grows wings and feathers. In many ways Bomb Chicken is like a living cartoon, and it helps ground you in this delightfully strange world. Musically, the game is a mix of ambient tunes full of eerie mystery and a little menace. Imagine a mixture of Indiana Jones with a dash of Bomberman, and you have a decent idea. The sound effects are also spectacular, bursting with flavorful effects that not only sound great, but also help you react intelligently to threats in your adventure. Put simply, Bomb Chicken is a feast for your eyes and ears. I almost have no real complaints in Bomb Chicken, other than one small one. I wanted to spend more time in this world. 29 stages isn’t too few, but after beating the game in about 5 hours or so, you’ll want any excuse to spend more time adventuring. On that note, it was a little disappointing to me that 100 percenting the game by collecting all the gems doesn’t unlock anything. I was hoping for maybe some bonus stages or a hidden boss or even a slightly different ending, but alas, all you get is extra lives. That said, when the only complaint I can make about a game is I didn’t get enough of it, that tells you it did plenty right. In the end, I don’t know if the bomb or chicken came first, and I don’t care. They are delightful when mixed together, and Bomb Chicken is a true gem. It’s a colorful and challenging game that is full of personality, and it’s truly a one of a kind. It plays marvelously on the Nintendo Switch, and is a good contender for one of the best indies I’ve played in 2018. Nitrome have done great work with this one, and I find myself eagerly anticipating whatever they hatch next.